When Isabella Nunez, hacker for hire, announced she was going straight, offers poured out from every development team and government think tank in America. When her friend offered her an anonymous position where she would be treated normally and no knew about her past she jumped on the opportunity. Then she met Brian Hamilton. They shared company jokes and then started to play in the company’s system. 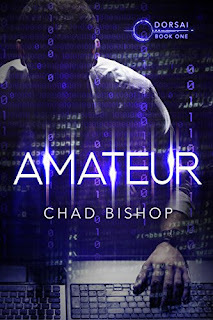 Before long Isabella would find out she wasn’t as anonymous as she thought and Brian’s attention has less to do with her and more to do with becoming a hacker for hire again. This is the first book about hacking I have read and I must say that I truly enjoyed the mystery and intrigue of the book . When Isabella Nunez decided to go straight and give up hacking she gets job opportunities from every corporate development team and think tank in America . But when she starts a job that she thought was anonymous she finds out that she wasn't a hidden as she thought and the man who hired her isn't really as to like as she thought .